Note - If a CMP module is faulty, replace the entire CMU. You can display general information for CMUs. See Display General CMU Information . You can find a SPARC M5 CMU to upgrade to a SPARC M6 CMU. See Display the CMU Quantity and Type. Determine how much memory is in the DCU or system. You will need this information when restarting the PDomain. You can count all of the DIMMs in the server. Alternatively, you can check the memory in a specific DCU. Stop the PDomain that contains the CMU. Determine which PDomain contains the CMU. Light the blue Ready to Remove LED on the CMU (CMUx). Go to the server and locate the CMU displaying the lit blue Ready to Remove LED. Note - If you change your mind and decide not to remove this component, execute the return_to_service_action command from the above path. A 12 ft (3.6 m) antistatic wrist strap is included with the replacement CMU. Squeeze the CMU extraction lever handles to unlock them and rotate the extraction levers to the horizontal position (panel 1). 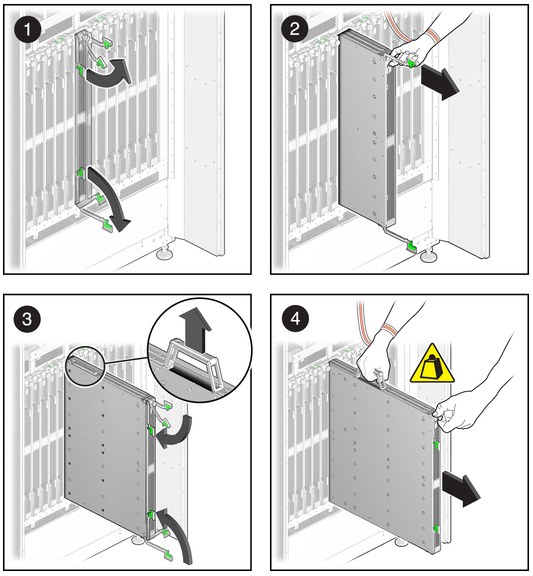 Pull the CMU out of the slot (panel 2) until the carrying handle is exposed. Caution - The CMU is heavy. A fully-loaded CMU weighs 56 lbs (25.5 kg). Unfold the carrying handle at the top of the CMU (panel 3). Holding the carrying handle and the extraction knob, pull the CMU out of the slot (panel 4). Place the CMU on a static-safe mat. To replace a DIMM, see Remove a DIMM. To install a new CMU, see Move DIMMs to a New CMU. To install a CMU filler panel, see Install a CMU Filler Panel.